Take whole red pepper and cut top off, remove all seeds, place on platter and fill with Gunther's Roasted Garlic & Sundried Tomato Vinaigrette. Cook pasta al dente (just slightly undercooked) according to instructions on the packaging. Shock cooked pasta in cold water and drain well. 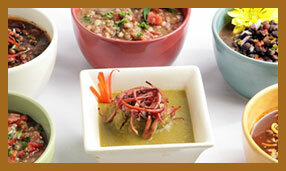 Gently toss with vegetable oil and store in a sealed container in the refrigerator. 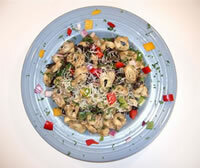 Place diced portabella mushrooms in a zip lock baggy and marinate with 3 ounces of Gunther. In a hot rondeau pan, or high sided saute pan, heat 1 oz olive oil and add red, yellow, and green peppers and red onions. Stir occasionally until tender and just starting to caramelize, about 3 to 5 minutes. Do not burn. Add garlic and saute for 30 seconds to one minute or until tender. Add marinated portabella mushrooms and saute until tender - about 2 to 4 minutes. Reduce heat to medium and add tortellini - gently stir until heated through. Try not to break up the tortellini. Add the last 6 ounces of Gunther. Reduce heat to medium low and leave on to reduce sauce to a thick consistency, stirring occasionally so the tortellini does not stick to the bottom of the pan. Check flavor and adjust with kosher salt and fresh ground black pepper if needed. Place in large bowl and garnish with fresh grated parmesan cheese and parsley. **Note* This is a great recipe to use up leftover vegetables of your choice. Marinate the sea bass in a zip lock bag for a minimum of 45 minutes in a refrigerator. While sea bass is marinating, mix the diced red onions, tomatoes and basil in a small bowl, add olive oil and season with salt/pepper. Cover and refrigerate. Place the marinated sea bass on a baking sheet and place on middle oven rack in a preheated 375 degree oven. 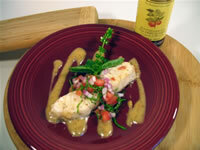 Once it's cooked, place fish on plate and top with chilled red onion, tomato and basil compote. Garnish with basil leaves. 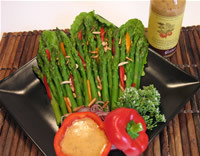 Extra Gunther's Gourmet Roasted Garlic & Sundried Tomato Marinade can be used to paint the plate (see picture) or as a dipping sauce. 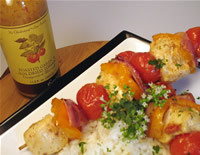 On each skewer alternate the pork cubes, yellow pepper quarters, red onion quarters and cherry tomatoes. Place kabobs in a zip lock baggie and marinate with Gunther's Roasted Garlic & Sundried Tomato Marinade for at least 1 hour.